Lock in a great price for San Juan Chalet – rated 9 by recent guests! Nice cozy, clean room was very comfortable. Key was waiting in room as promised when we arrived, so we never really saw any staff. Location is amazing and we love the private shady lawn. Love the fact that our dogs could stay with us and parking was easy. The bed was comfortable and loved the heater in the bathroom! The futon seemed a tad worn, but we didn’t sleep on it so it didn’t matter:-) We also didn’t use the kitchen, however, this would be convenient setup for anyone who might need that while in the road. There’s also a small yard where our dogs could go to bathroom. Overall, nice, comfortable place! Very cozy yet roomy, private, pet friendly, amazing views from the upstairs room. Friendly hosts, and quiet for how close to the Main Street. We will be returning soon! Not really any interaction with proprietor. Spoke with housekeeper who told us where we were staying. The property was beautiful, private, within walking distance to main area of town. Pet friendly. Quiet. San Juan Chalet This rating is a reflection of how the property compares to the industry standard when it comes to price, facilities and services available. It's based on a self-evaluation by the property. Use this rating to help choose your stay! Offering free WiFi, San Juan Chalet is located in Ouray. All rooms are equipped with a satellite TV. Ouray Hot Springs Pool is 15 minutes’ walk from the inn. Each room features a private entrance, a seating area and mountain views at San Juan Chalet Ouray. A microwave, a small refrigerator and tea and coffee-making facilities are also included. 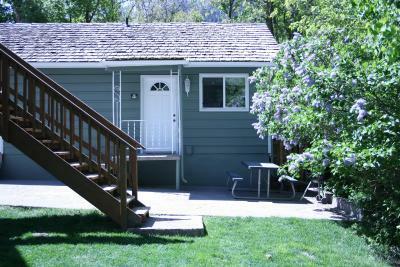 Guests can enjoy a garden and barbecue facilities at Ouray San Juan Chalet. Free parking is provided on site. Ouray Ice Park is 5 minutes’ drive from the inn. Orvis Hot Springs is 8.9 mi from San Juan Chalet. When would you like to stay at San Juan Chalet? This apartment features a patio with mountain views, a satellite TV and a kitchenette with a microwave and a small refrigerator. An private bathroom is also included. This apartment features a patio with mountain views, a satellite TV and coffee-making facilities. An private bathroom is also included. This apartment features a balcony with mountain views, a satellite TV and coffee-making facilities. An private bathroom is also included. House Rules San Juan Chalet takes special requests – add in the next step! San Juan Chalet accepts these cards and reserves the right to temporarily hold an amount prior to arrival. Room could have used a table/workspace but other than that everything was good. No breakfast. TV didn't work. --No real fresh air circulation, especially on a summer's night: for example, blinds or similar on the exterior of the entrance would allow guests to leave the screen door open for that cool mountain air to flow in. Having to use a fan and/or AC up in the mountains is not what you'd expect and is also rather wasteful and noisy. --Likewise, the lack of curtains/blinds on the large picture windows: it allowed the hot sun to stream in during the day and heat the room up. Great in the colder months, but not so in the warmer! --Kitchen facilities: more counter space and a water kettle would be welcome! --The garden could use a bit of love! The TV was a little small. Loved location. Clean room. Quiet area. When we arrived it was unclear where to enter the facility or to find the person in charge. Front door of home was open, but no one ever came to help us. We went around to where the rooms were and spoke with a woman who was vacuuming. She said our room would be ready in 30-45 minutes and pointed it out to us, so we explored the town and returned in an hour. We found our room unlocked with the key inside. After that we never interacted with anyone from the property. We stayed 2 nights. Overall, the experience was enjoyable and we would stay there again and recommend it to others.